Entering the Gubei branch is like walking into a very repetitive IKEA showroom: pale, Nordic wood and hempy fabric. It’s all very zen. The service is as efficient and minimalist as the decorative aesthetic. There’s a picture menu with English and Chinese descriptions, which makes things easier considering the vast selection on offer. We went for a range of mock meats and meaty veggies, but there are plenty of fresher-looking options. Good drink options, too. We were given some little pickled vegetables, roasted beans and orange slices before our orders started arriving. I’d recommend almost all of what we ate: the deep fried mushroom shashliks (60rmb) were the first to arrive, and they didn’t last long. 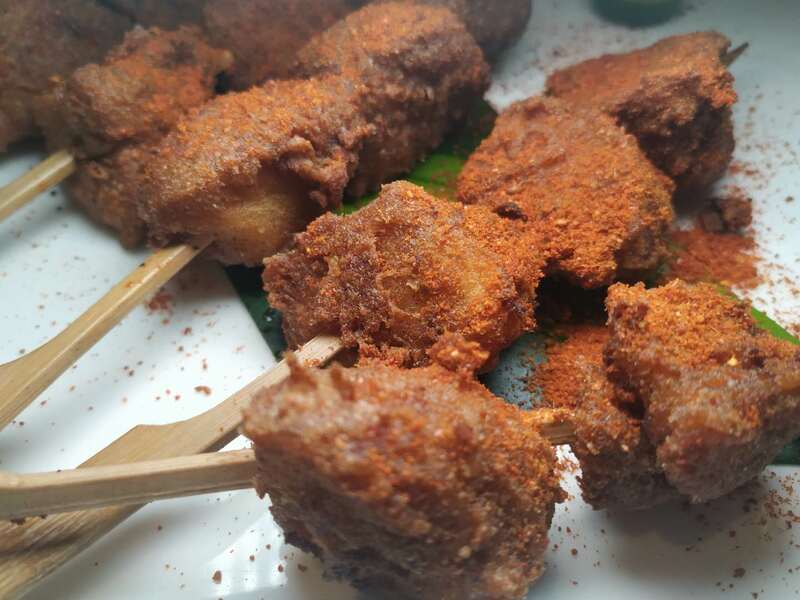 Fragrant, spicy and addictive. We also loved the stir-fried rice cakes with truffle sauce (68rmb), even though they were very restrained with the actual truffle. The dumplings with chili oil (25rmb) were satisfying, as were the deep-fried vegetarian chicken shashliks with satay sauce (60rmb). 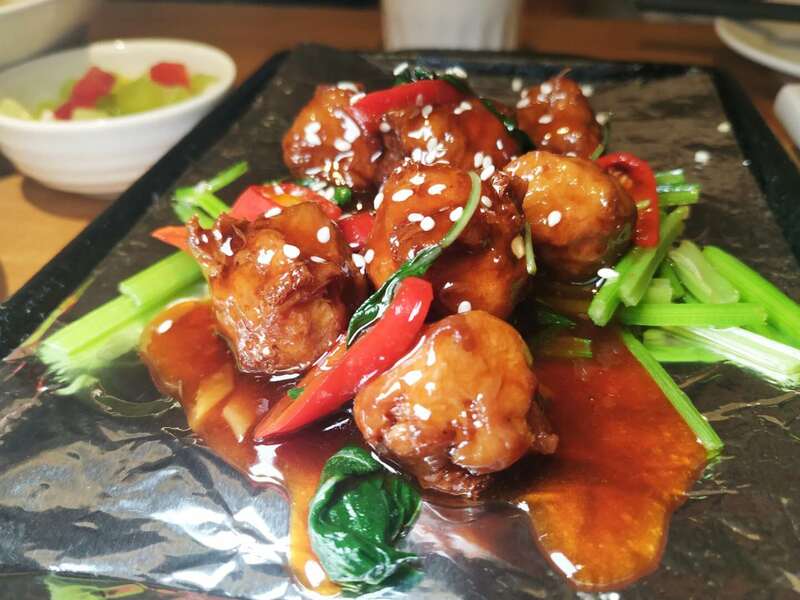 I wouldn’t rush to re-order the vegetarian chicken with three cups of sauce (36rmb), but it certainly wasn’t bad. In total, we paid 249rmb for all of the food mentioned above. Vegetarian Lifestyle is adept and reliable. 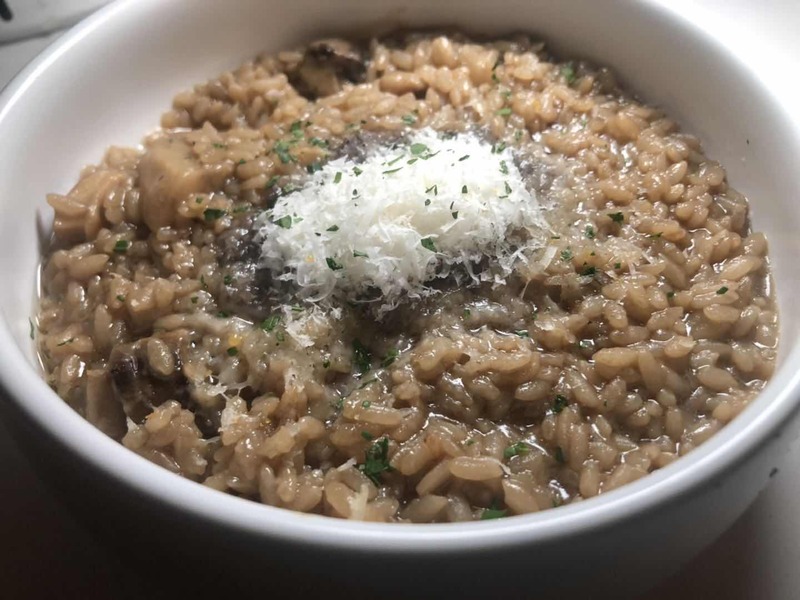 They serve some of the best vegetarian “meat” in the city, and their mushrooms are magic. For good-value, well-balanced food, it’s a winner. 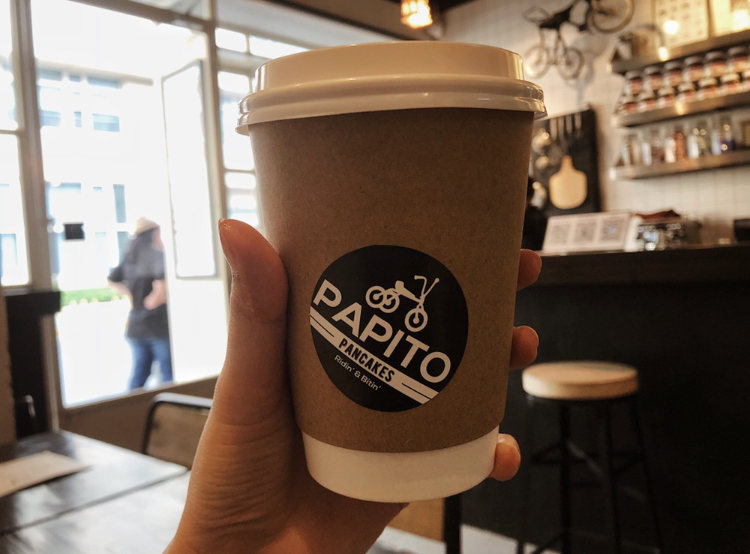 Passed by Papito’s new location in west Nanjing and got to get one. The shop’s old location was more accessible for me, and I love their pancakes! The new location still remains the same feel as the old one, small but super cool with black and white industrial theme, and the Nutella jars on the wall is still great to look at. It wasn’t very crowded when I was there. I found out they have plug on every sit, so I sit and opened my laptop, and enjoyed the pancake while working. I had a caramel pancake with ice latte. They are always very generous with the filling, and let’s be honest, who doesn’t love overloaded fillings when it comes to Nutella or caramel? Salty pancakes are tasty as well with real and authentic ingredients. 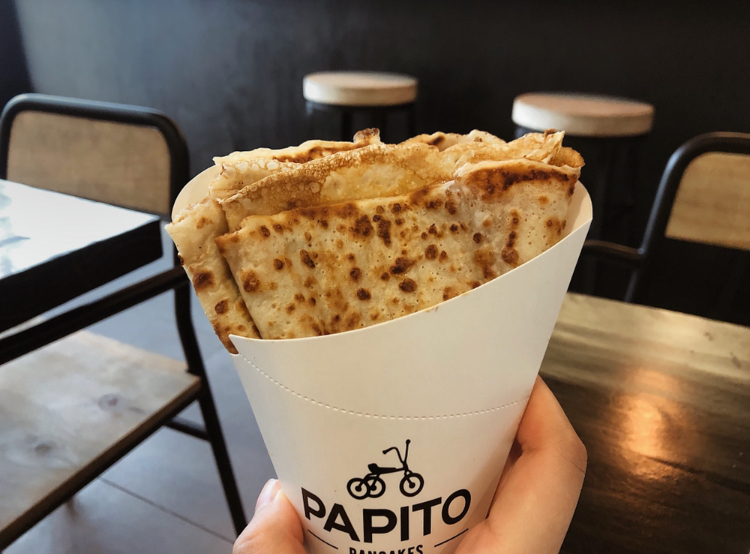 Crepe are always soft and freshly made. Iced latte was good too and I also recommend their smoothie blend. Pancakes are around 35(sweet) and 45(salty), coffee and tea are around 20, and smoothies are around 30. 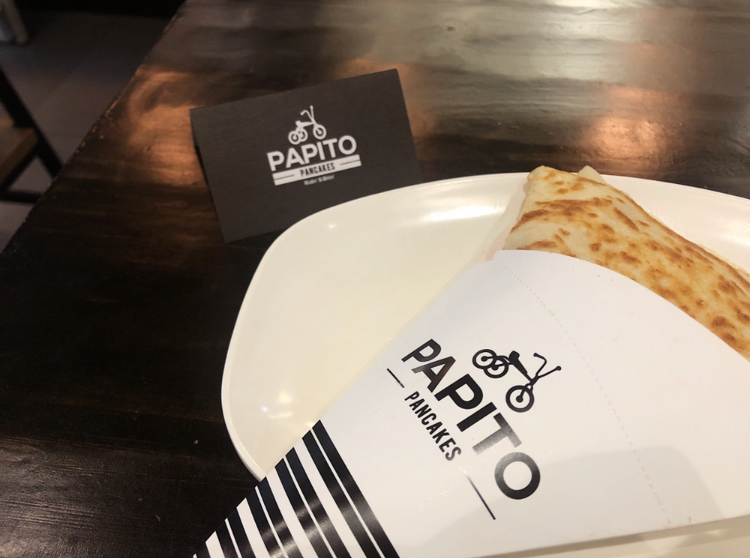 -Papito serves a selection of delicious street style pancakes with real and authentic ingredients. 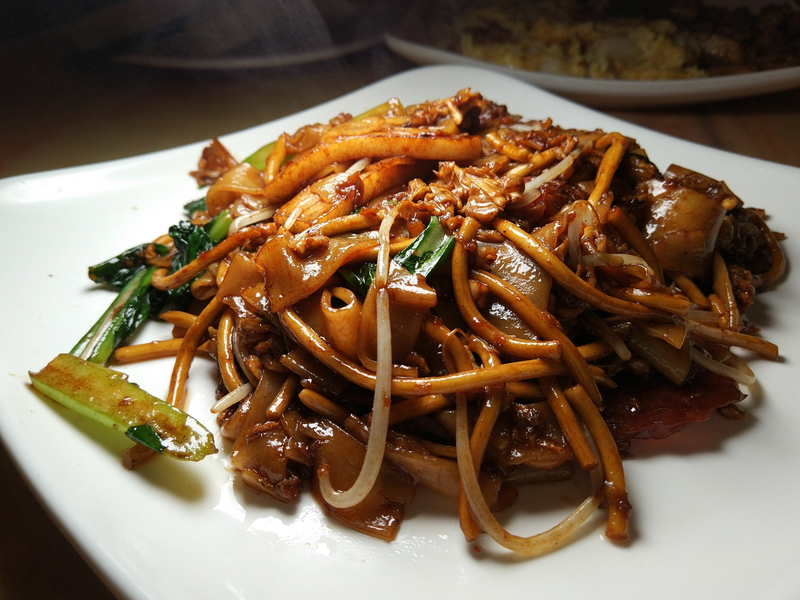 Liu Tang Men - formally known as Liu Dao Men - is Sichuan noodles done right. This might sound like a big claim, but as far as noodles go in Shanghai, they really don’t get much better. Especially at this price point. 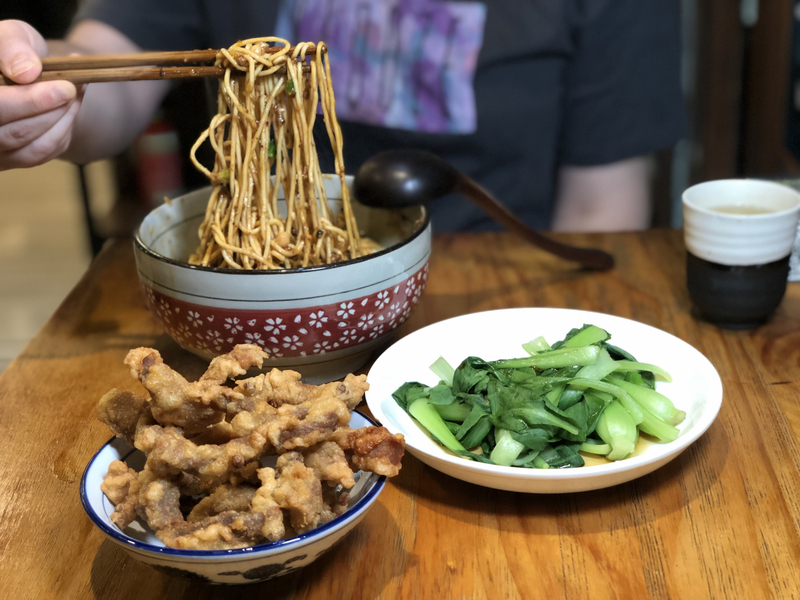 The dan dan mian, a Sichuan classic, is delicious – toothsome noodles covered with spiced minced pork, chili oil, and crushed peanuts – but it’s snack size. 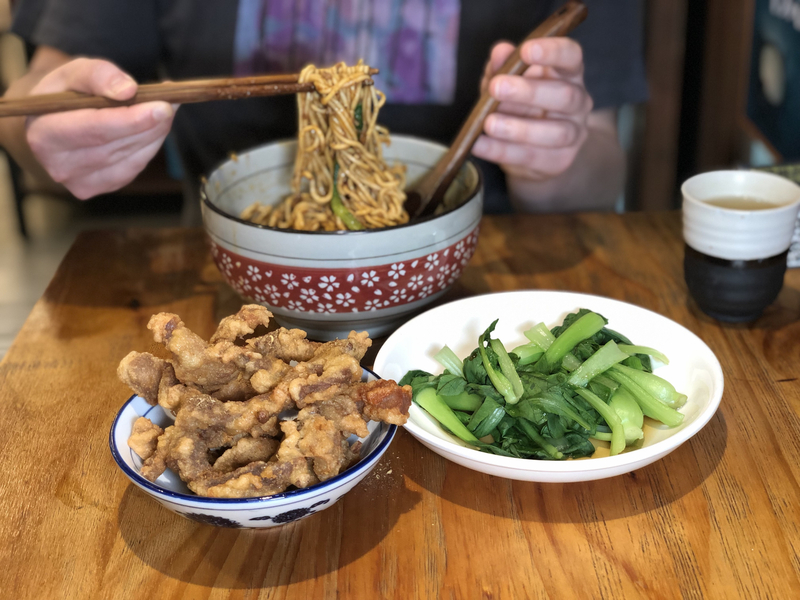 You should get them, but you can also grab a plate of Yibin Burning Noodles for a full-size portion of something pretty similar. 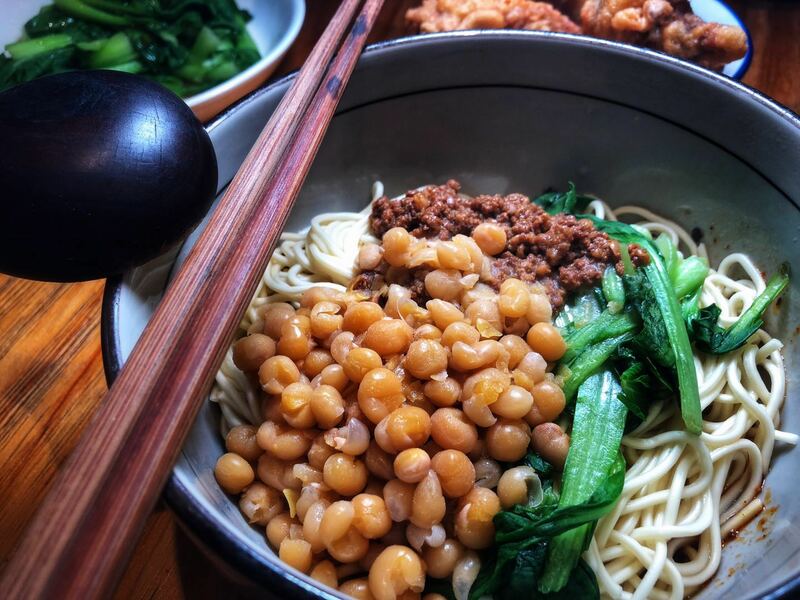 The Chongqing Advanced Noodles (or wanza mian) are also a treat, and a little less dry, coming through with a topping of minced pork and chickpeas. Mix it up and its magic, the chickpeas disintegrating and creating a thick, almost creamy sauce. 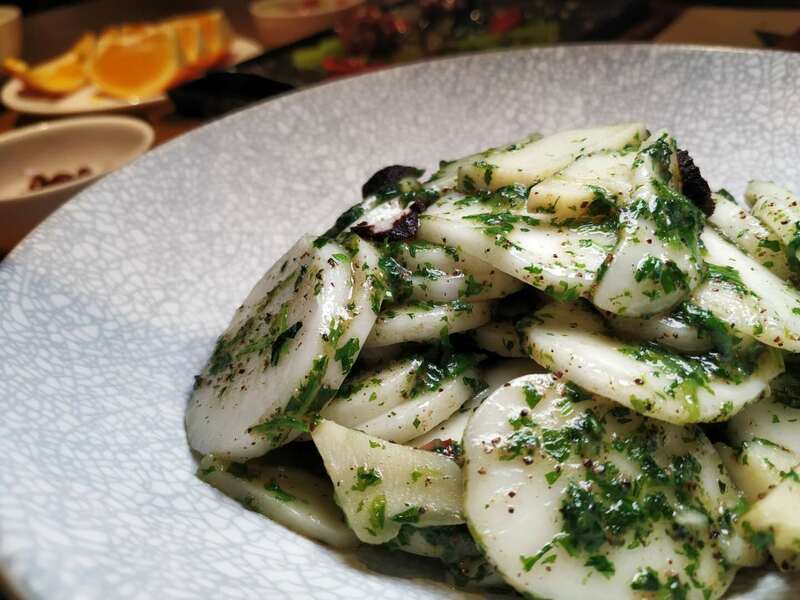 Most options will set you back between RMB 25 and RMB 40, can come vegetarian if requested, and have customizable spice levels. They're also often available either dry or with soup. 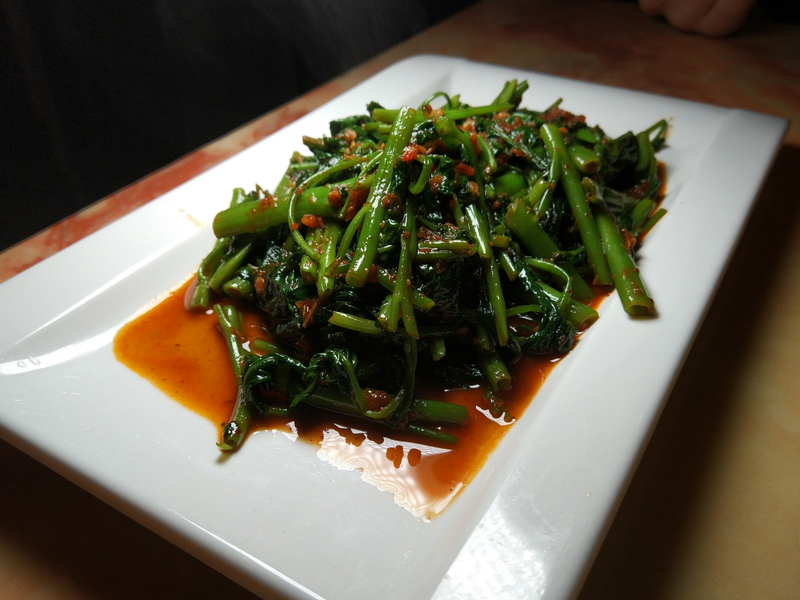 There are a few side dishes available, like crispy fried pork, sauteed green veggies, and wontons. Good for if you're going for a bit of a bigger meal. It helps a lot that the atmosphere matches the food. It’s a laidback spot with an interesting music selection. 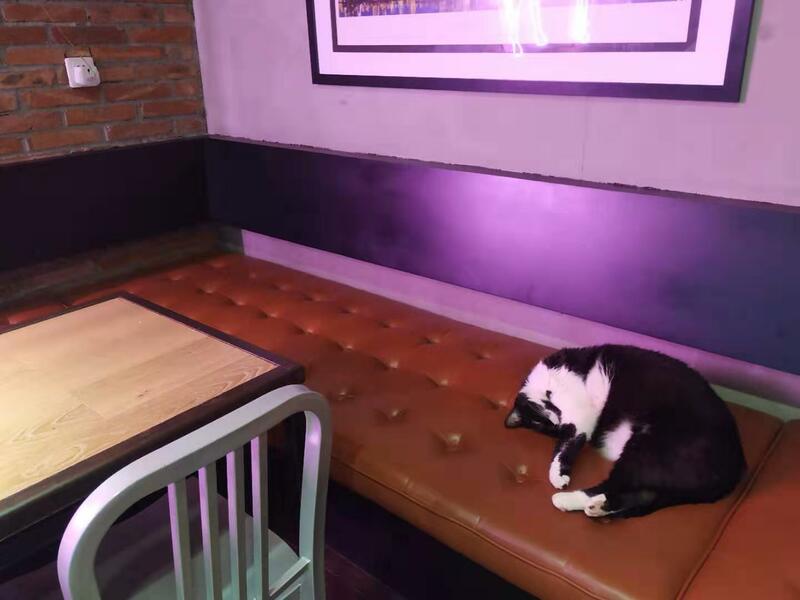 On sunny days, the owner – who Smart Shanghai themselves call “an aging rocker from Chengdu” - is likely to be sat outside the entrance with his dog, banging on a hang drum. Good vibes. This a great regular option if you’re in the neighborhood, but these noodles are also worth travelling for. If you have any interest at all in Sichuan cuisine, or just noodles in general, you really should stop by. Summary: A smart neighborhood noodle spot serving up classic Sichuan noodles as well as a selection of side dishes. 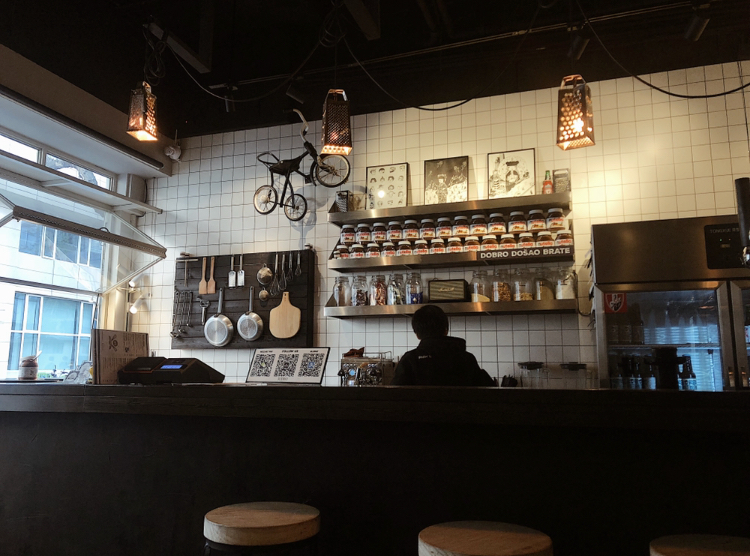 Friendly owners, laidback café vibes, and killer noodles. Good either for a quick lunch or more languorous dinner. If you really love eating and enjoy each gastronomic experience like it was your last dinner, then you will truly appreciate Bird. Why? 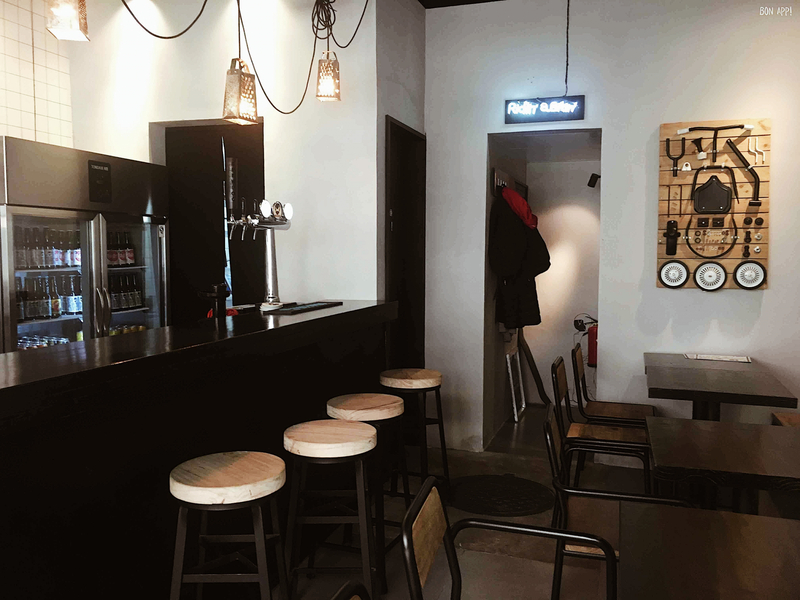 Easy, because is a cozy restaurant with no more than 20 seats, with an open kitchen where you can see the Chef cooking each dish carefully and taking care of every detail before the plate comes to your table under a delicate tailor-made menu. 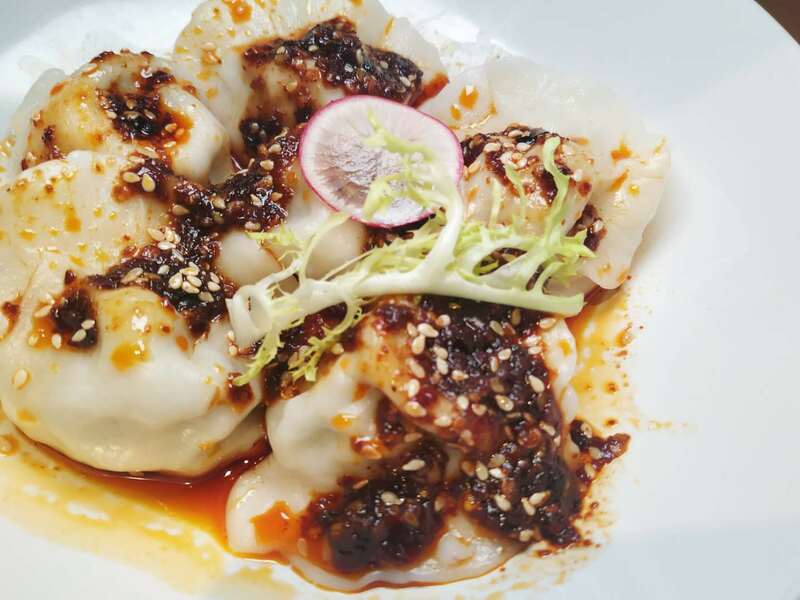 The menu changes seasonally and consists in a variety of Asian fusion dishes to share –or not-. That's not all. The wine selection and the cheese selection are amazing. They have a nice wine by glass variety and also they offer the “Carafe” version which is so convenient. We had a bit of everything plus a carafe of cabernet franc. 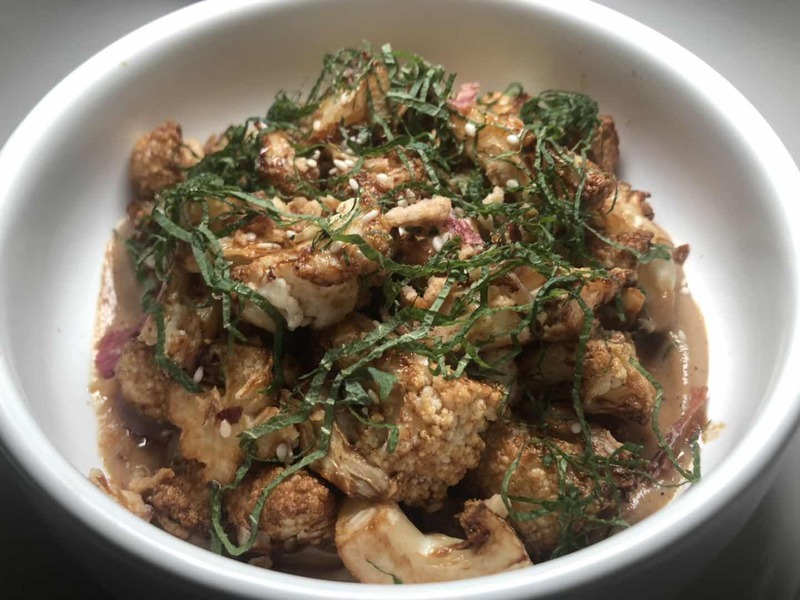 The first place goes to the money miso fried cauliflower; the second place the truffle risotto and the third to the smoked salmon. The chicken nuggets are a must try as well. The ambience is lively and the staff super friendly. Prices are accurate and the dishes were excellent in flavor, presentation and portions size. 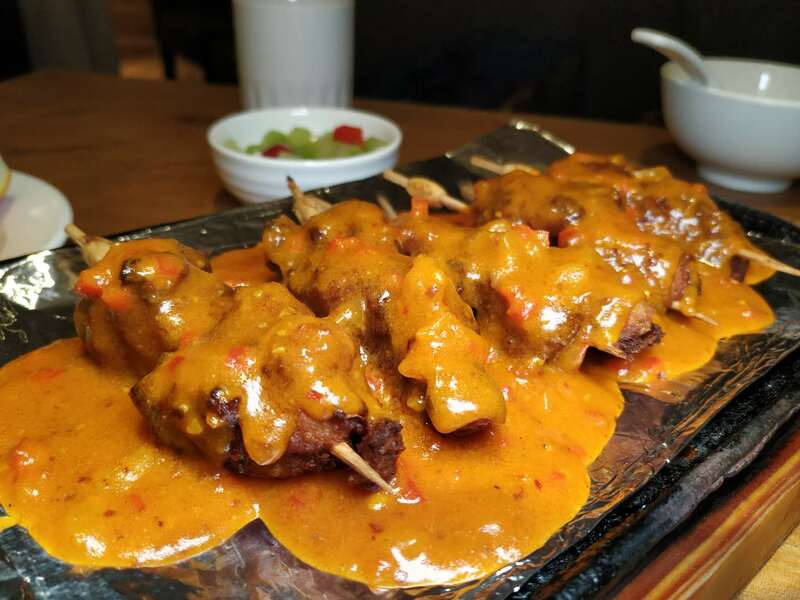 Around 250/300 yuan per person and you get an intimate and unique meal. 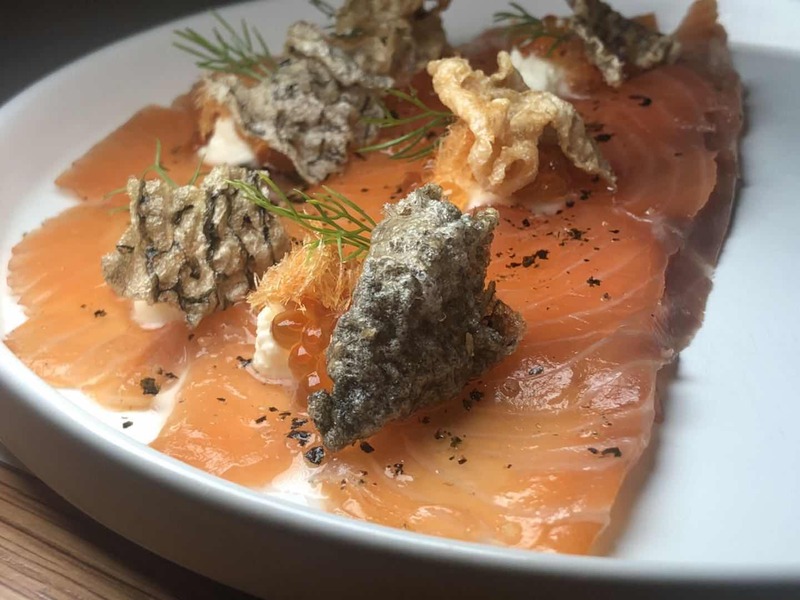 Bird Wine Bar & Kitchen is a spot where foodies like me will definitely return! The Beef: We missed the daytime action here, apparently they do an awesome brunch til 4pm (note to self). But real fun starts after dark when the neon signs burn brighter and the cats come out to play. When we arrived, it was standing room only at a high table, but the vibe was so chill that nobody seemed to mind the cramped yet cozy space. The service was so personable even at the start, where they apologized profusely and promised us a seat once a spot at the bar opened up (which they made good on). The attentive service lasted through the time we were there. Japanese barman Roger is the best host ever, and judging by the enthusiastic hellos from fellow patrons, we were not the only people to think so. In addition to the regular line-up, the highlights here are the “tea” or “coffee” cocktails. We tried one of each to start. 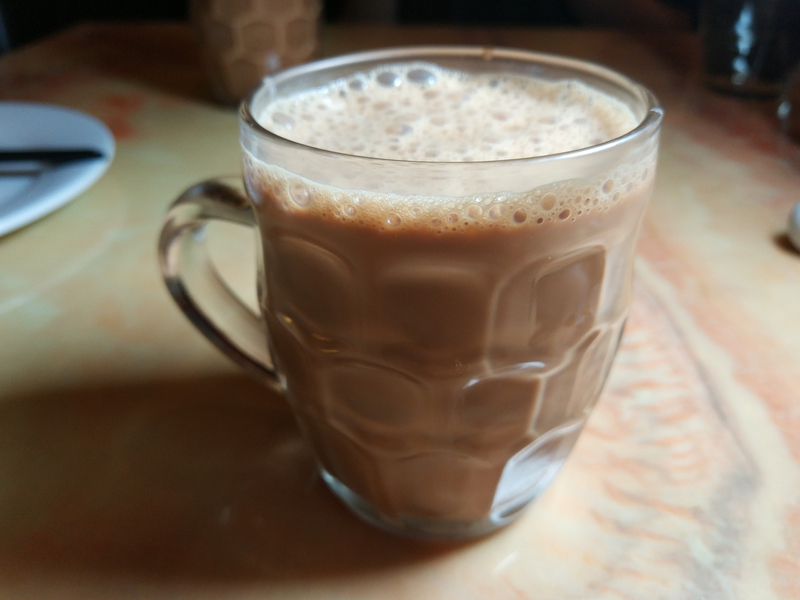 I am a tea drinker by day, but usually shun tea cocktails because the milder flavors of tea bring out the harshness of the liquor they are made with– à la vodka or whisky (no whisky green tea here). I can’t say the tea drinks here changed my mind, but they were a refreshing surprise and if that’s your thing, you’d be in heaven here. Food was also divine. 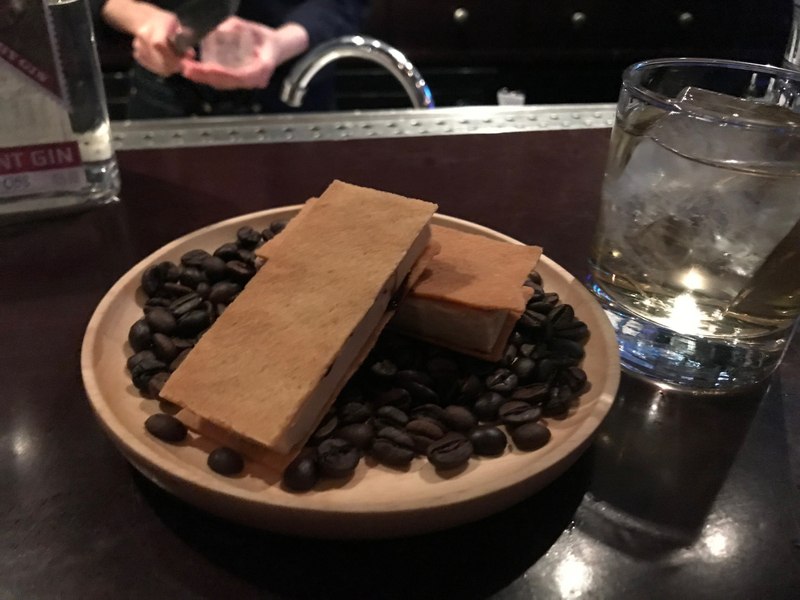 The foie gras sn*ckers was completely unexpected but beyond words, and the bed of coffee beans paired perfectly with the foie in terms of flavor (rich yet light) and texture (more crunch!). 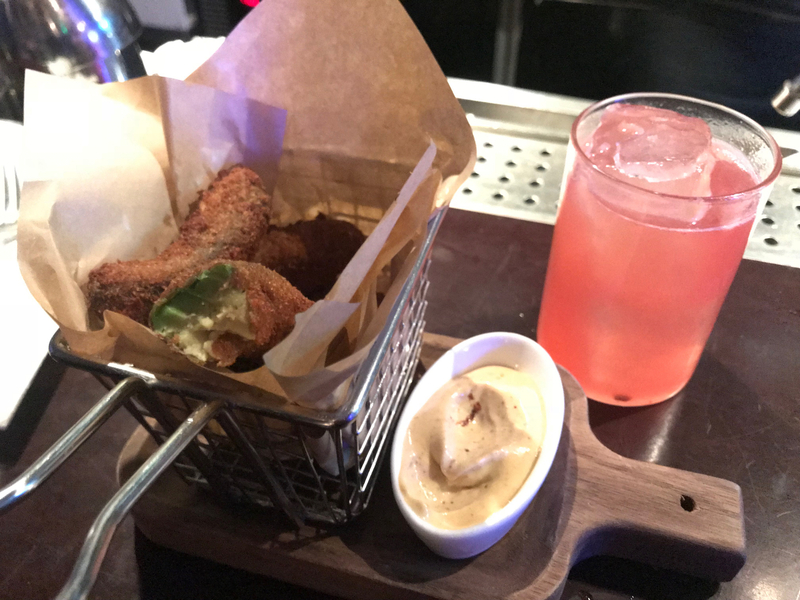 Comparatively, the avocado fries were heavy since they were breadcrumb battered. The Gang: The cool “older” kids who want a low-key vibe that still serves sophistication…and willing to shell out a bit more for it - especially later on as they move up the “ladder”, or rather stairs to Sober Kitchen & Sober Society. The Damage: 3-4 rounds of cocktail plus late-night snacks for two on a date night, approx. 650RMB. The Down n’ Dirty: Spankin’ clean. You’ve probably passed by Dong Jing Ye Shu a bunch of times, heading down Fumin Lu on the way to Donghu, Julu, or one of the of bars and restaurants in between. 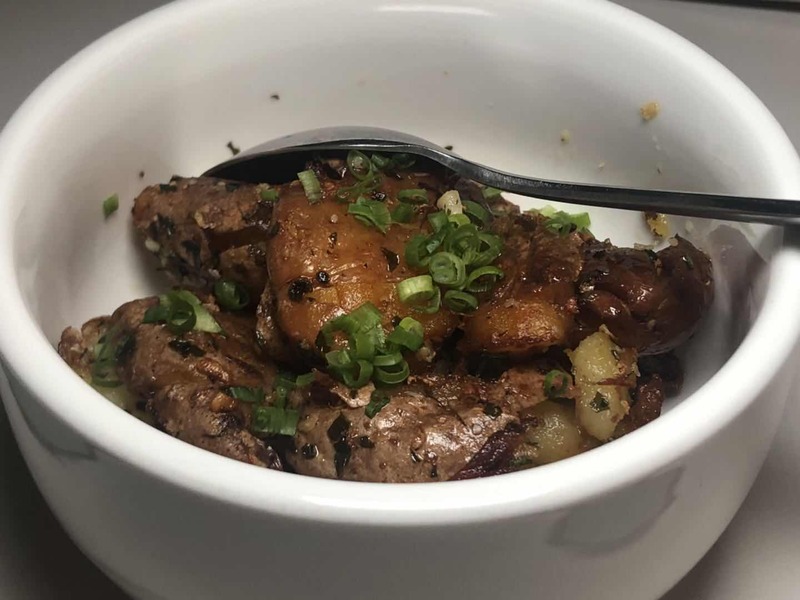 They serve up a full range of Shanghainese favorites along with a couple of other greatest hits dishes that you’ll find on a lot of other menus around town. Go for the Shanghai stuff. A lot of people say that they don’t like Shanghainese cuisine’s sweetness and light touch, but this place does it really well. The place itself feels mid-range and old-school, like a fancy old dining room that has been allowed to age a little bit. It has some charm, some atmosphere, and a crowd. Definitely more of a round tables, big group sort of spot. 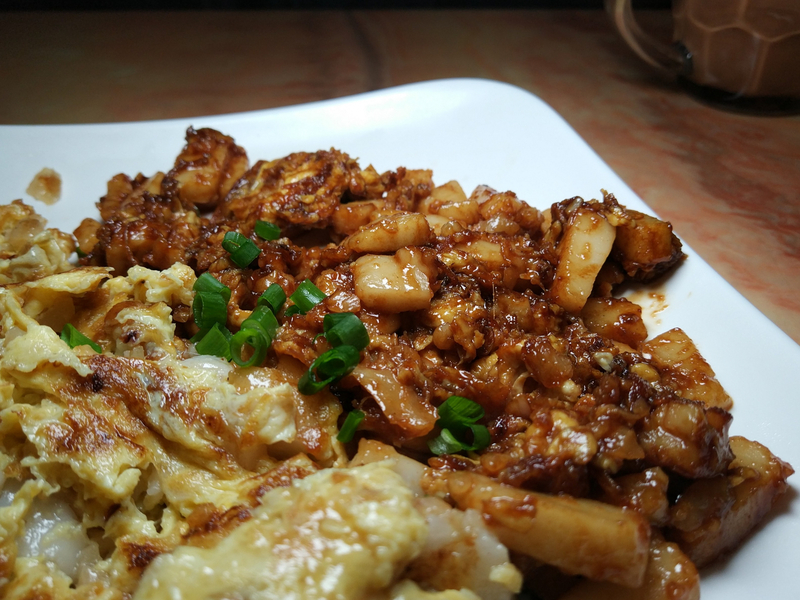 A few of the dishes really stand out, like rich minced crab over scrambled egg whites, drunken chicken (or zui ji) cooked in yellow wine and served cold, and a hongshao (or dongpo?) pork that is probably one of the best I’ve had in town. The jiu xiang cao tou, “grass tips” cooked in alcohol, was great too. Despite slinging local cuisine, this is something different from your average foreigner-friendly Chinese place. Good to try out if you’re getting a little tired of Dongbei, Sichuan, or whatever Yunnan place you and your crew go to every other week. If you’re intermediate with Chinese food and/or the Chinese language, I’d venture that it’d be a decent place to take an adventurous out-of-towner that wants to sample something really local, too. 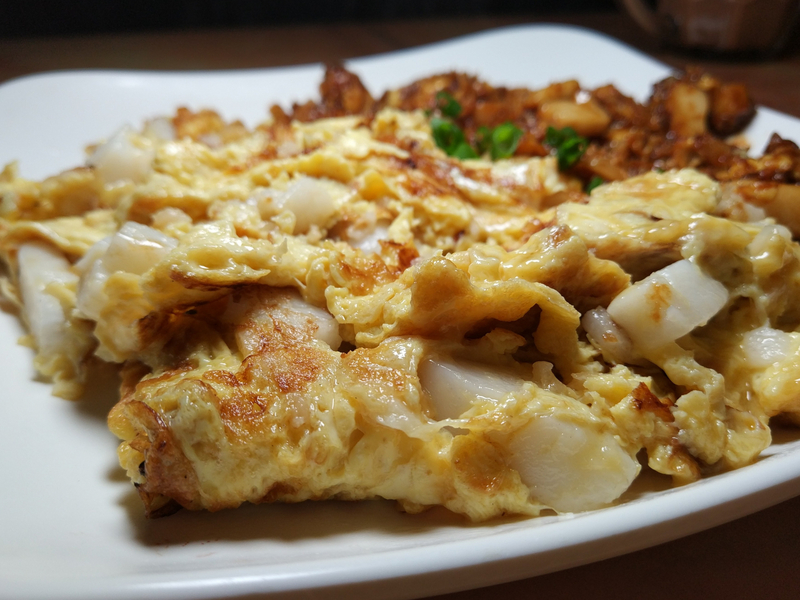 Summary: An old-school dining room serving up a good-to-great menu of mostly Shanghainese classics, in a killer downtown location. Excellent option for a group dinner before hitting one of the many, many bars in the neighborhood. Before I visited, a friend told me I “must” order the avocado and cucumber shake at Charlie’s. Of all the suggestions. I’ll order a small salad, too, while I’m at it, I messaged back. Eye roll emoji. Crying laughing emoji. Fortunately, it doesn’t matter which smoothie you order at Charlie’s. They all taste of vanilla. That’s no bad thing – the aforementioned avocumberganza (35rmb) is absolutely dreamy and refreshing. I can also confirm that the blueberry smoothie and the vanilla smoothie are vanilla-flavoured. Probably all of the others are, too. I’ll have to check. The food hits the same standard. The brioche buns are an industrial-level Paul Hollywood Good Bake. 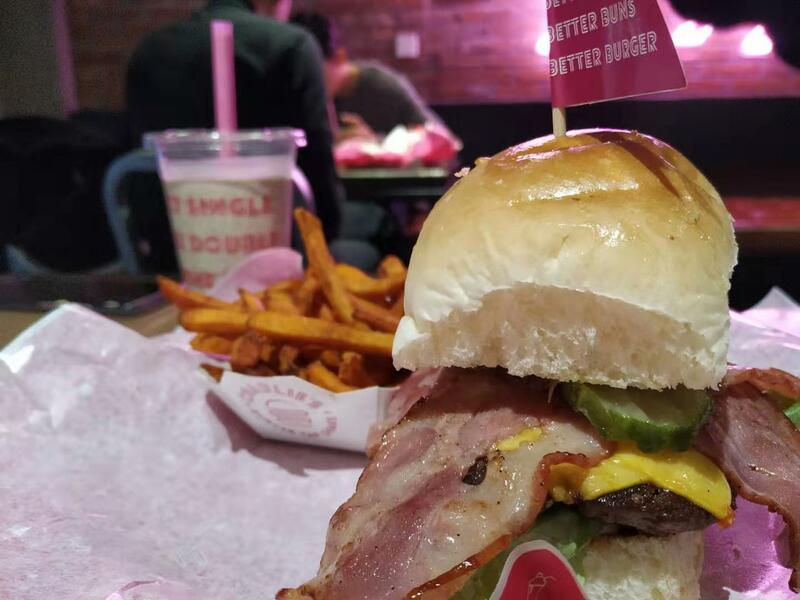 Burgers are well-stacked; there’s a fried chicken (35rmb) and a veggie (avo, egg and cheese, also 35rmb) option, plus some fishy things; they have hot dogs too. Importantly, it all tastes exactly how you want it to taste. 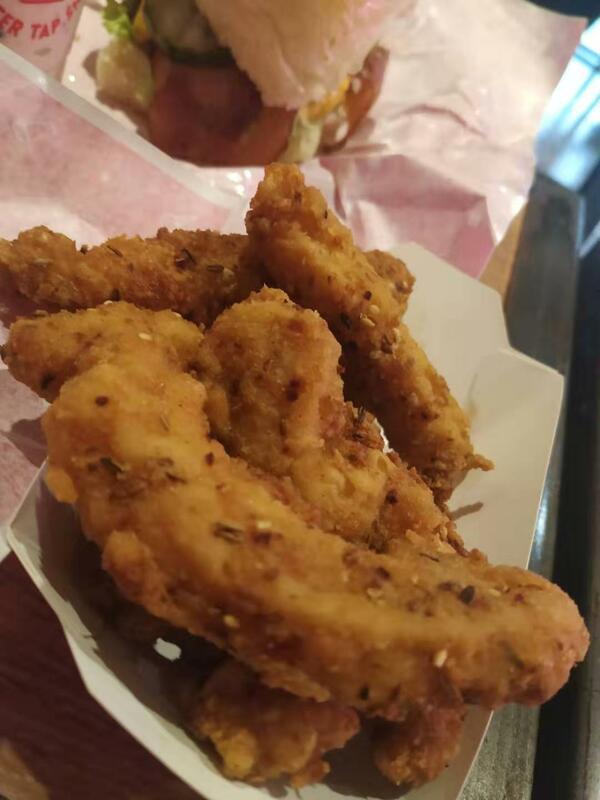 The sides are another source of delight: you can get a little pot of chilli (salty but tasty), fries (sweet potato, cheese-topped, any way you like) or chicken tenders (flecked with crispy sesame) for 20-35rmb. Issues? The ranch dressing is a weakness, the sauce selection in general is limited (someone buy them some BBQ), and there isn’t much atmosphere upstairs, especially when they leave all of the windows open in February. The placid resident cat makes up for these, though, and the prices are friendly enough to allow you to invest in your own sauces. If you haven’t been yet, give yourself a low-budget treat night and get down there. 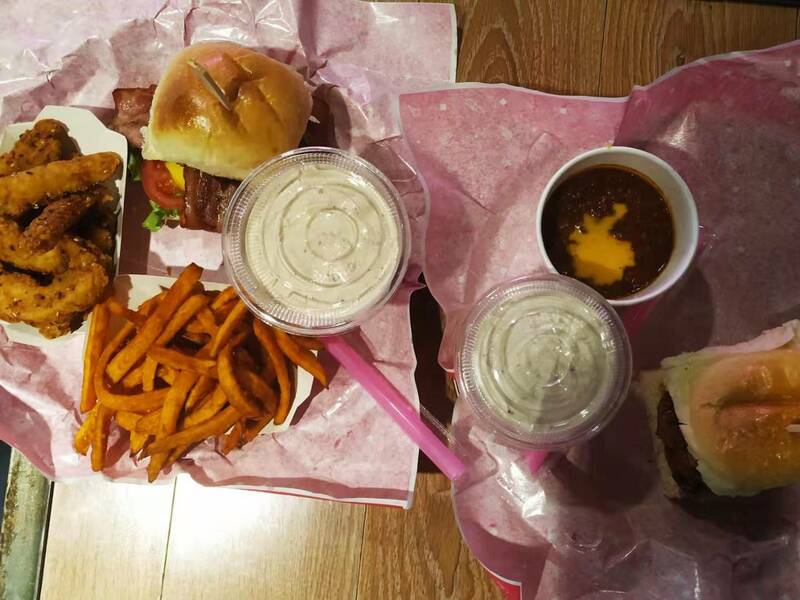 The shakes are addictive, if homogeneous; the food is well-done, if simple; the price point is on point. I can see why the cat sticks around. At this price point, pretty much all Korean BBQ tastes the same. 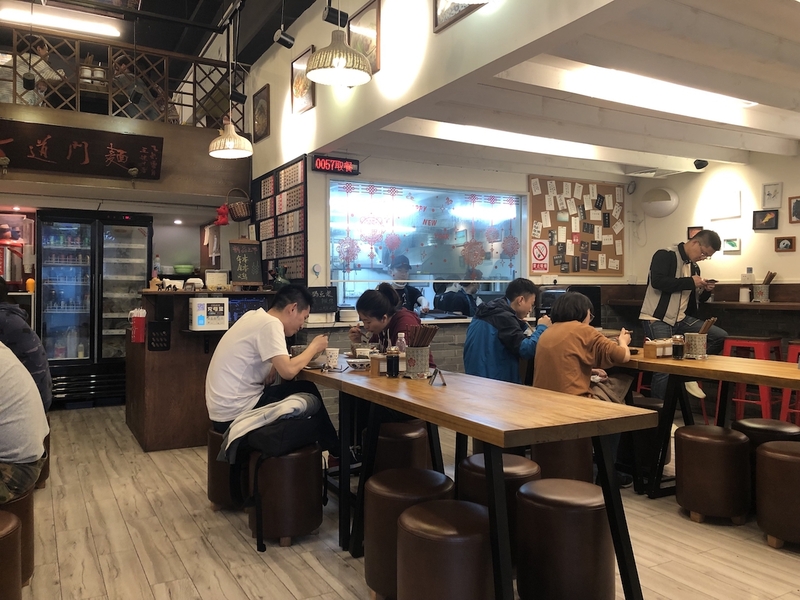 You know exactly what it's going to taste like, you know exactly what to expect from the meat, the seasonings and the side dishes...hey this might as well be any Korean BBQ restaurant anywhere in China. So why not get the most bang for your buck, and go to Rou Duo Fang for an all-you-can-eat experience on your next kBBQ outing? 精品雪花牛肉 Premium "snowflake" beef: It's highly marbled, and comes in small servings. We ate three servings. 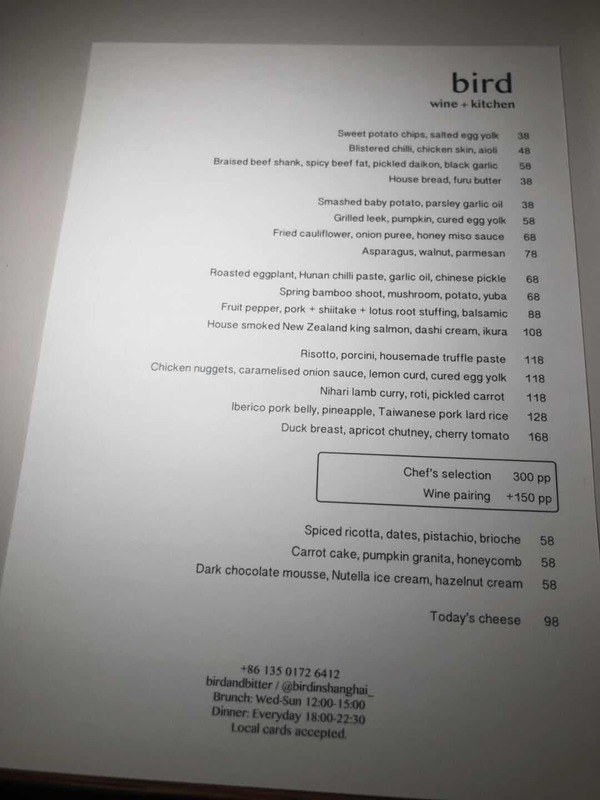 Supposedly a single serving of it is 198 RMB off the regular menu, but who on earth does that? 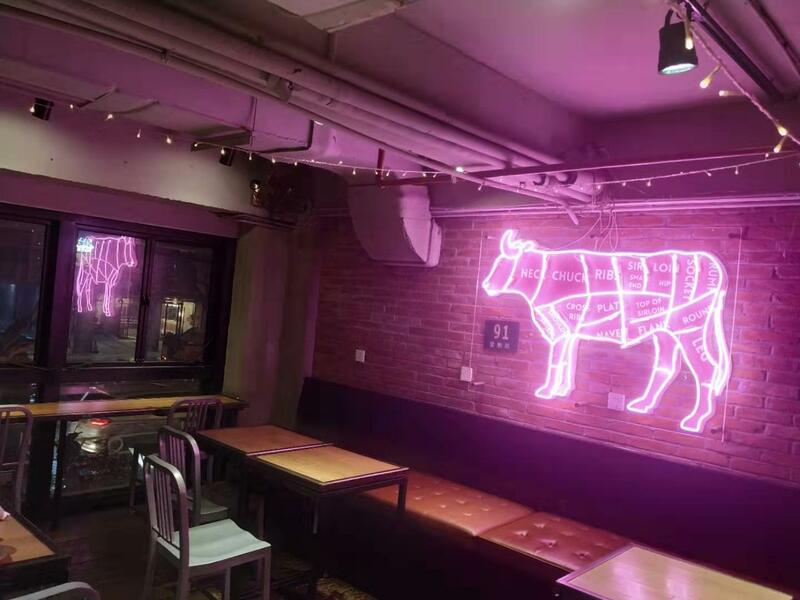 A fun fact about the Chinese "snowflake" beef cut is that it can come from any relatively fatty cut of the cow i.e. it's not standardized as to where it comes from, so the flavor can vary greatly. Wherever on the cow this snowflake beef came from had great beefy flavor. LA调味牛排 LA marinated beefsteak: I have no idea what makes the flavor "LA", but it was saucy and flavorful. 牛舌 Beef tongue: Korean BBQ is a great way to get introduced to eating other parts of the cow if you haven't done so before. Cow tongue has a great chewy texture and strong beefy flavor. Its thin profile means its cooks in literally seconds - beware of overcooking! 蘑菇拼盘 - Mixed mushroom platter: No fancy mushrooms on here, just your regular mix of shitake/enoki/whitecaps etc. I recommend cooking them after you finish with a few rounds of beef, so they roast in the browned beef bits and fat. Seafood bibimbap (mixed rice in a stone bowl): This was flavorful, the seafood was well sacued, and the veggies tasted fresh. For bonus points, don't touch the bottom of the stone bowl under the rice has seared and formed a nice crust. Tofu soup: Was a bit bland compared to the punch of savory spiciness I usually expect from Korean style tofu soup. Salt roasted prawns: The girlfriend liked these and ordered two servings of them, but I personally didn't think the salt was doing any good on the outside of the prawns...by the time they finished cooking, it was all rubbed/roasted off and you had to dip the prawns in other sauces anyway. The all you can eat option includes beer, soft drinks, and soft-serve ice cream in a cone. This is a good place to have a birthday party, kick back with friends, and stuff your face with meat. I've had better Korean BBQ in Shanghai, but I've never had better value. I recommend making sure you get a roasting surface with a flat surface, not a grill that will let the fat and drippings fall through into the fire. Let the meat roast in its own fats...it's so much tastier that way! They have different grill tops at Rou Duo Fang so you need to ask. 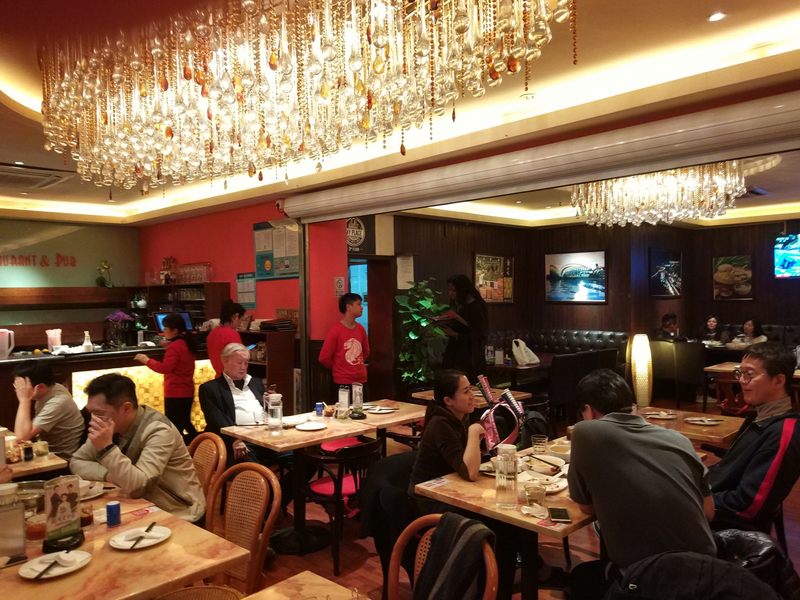 Rou Duo Fang is located at the intersection of Jiangning Road and Beijing Road, in the same building that has a Cha Li Si (Charlie's) on the first floor (the late night Hong Kong dim sum place, not the burger place). It's on the 3rd floor and it's always busy, so you might need to wait during lunch or dinner time. I stumbled upon this little Hainan Chicken Rice restaurant when wondering around People’s Square and decided to step in and give it a try. 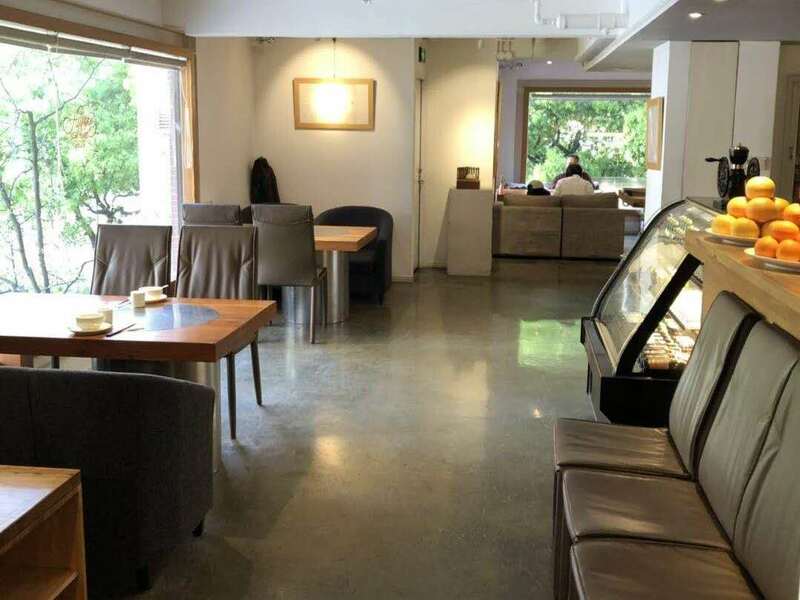 The restaurant is the size of a shoebox, with lined seating that face the window panels of the kitchen area and is only able to fit 6-7 people at once. But fear not! Instead of a sense of claustrophobia, this place gives off a sense of Zen due to its mini coin fountain, wooden placards of historical photos that line the walls, and light bulbs that hang from the ceiling. One of the placards claim that the restaurant holds a centennial brand and comes straight from Wenchang, Hainan, the origin place of the chicken rice. It also claims that all of the chicken served in this restaurant has lived for at least 180 days, meaning that it’s all naturally grown. The menu is simple with only a few choices as indicated by wooden placards hanging on the kitchen’s glass panel. You order across the window panel with the chef who will also be making your order. Language spoken here is probably only Chinese. 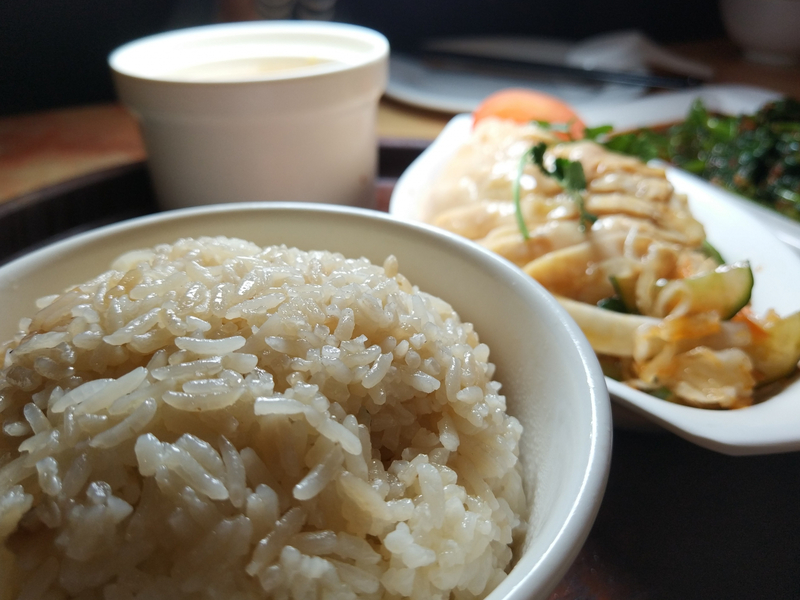 The 32 rmb chicken rice set menu is small in size and includes- chicken, chicken oiled rice, chicken soup, and side sauces of chili, garlic, and soy. The chicken rice was great, but what I really enjoyed was the chicken soup. Served in a porcelain colored tea pot paired with a matching tea cup with a design of a 3D fish at the bottom, the chicken soup was rich with flagrance and is displayed with a sense of ceremony. Little placards (I know, again with the placards) even indicated to you the exact order for which you should dip your chicken in each of the sauces, drink your soup, and eat your rice, to maximize the enjoyability of your meal. 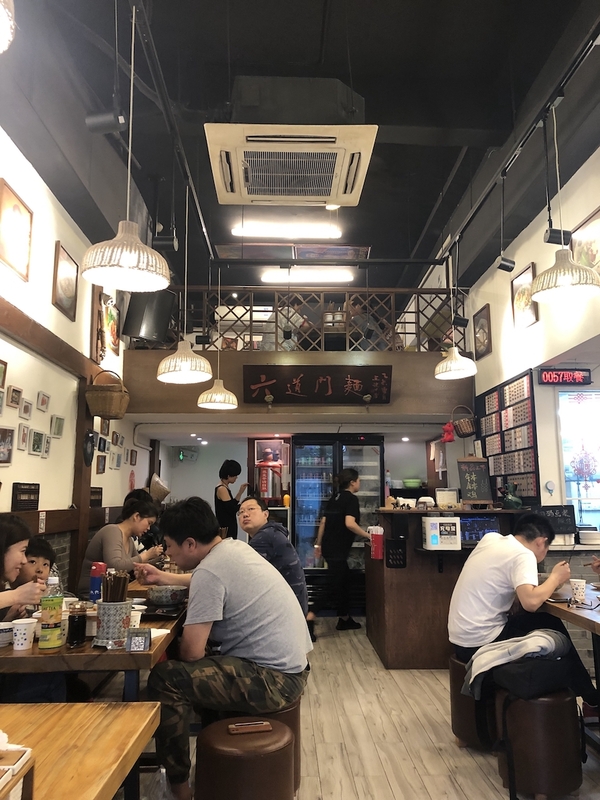 There was a sense of ceremony to eating at this Hainan chicken rice joint, like you weren’t just enjoyed a slice of Hainan chicken, but enjoying the history and customs that has come along with it. Being that there is limited space however, come by only if you’re looking for a solo-meal or an intimate meal with one or two friends. 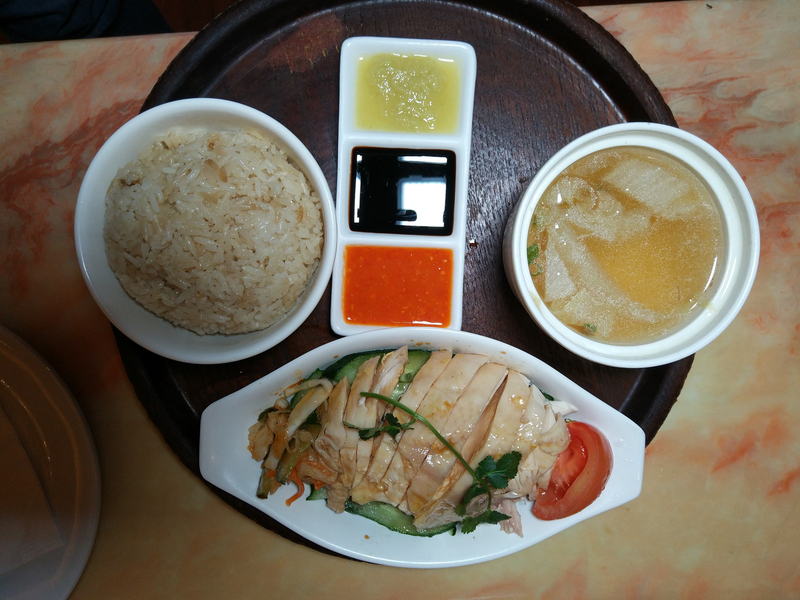 Prices are super afforable but get the bigger portion of the chicken rice set if you're feeling hungry as portions are small. I'll make no secret of it: I rely on Bon App on lot when I'm looking for new restaurants. It's so easy, convenient, and generally pretty reliable at pointing me to new places to stuff my face with delicious food. It's not infallible, and sometimes you have to take a risk to find that out. See, the current (March 2019) Bon App rating for Orchard CRC is 67% positive. Which, for those of you who aren't familiar with Bon App's generally inflated rating system, is pretty bad. I have never gone to a restaurant with such a low positive rating when I had prior knowledge of its low rating. This means that despite Orchard CRC being very close to my hood, and despite it featuring a cuisine type that we just don't have much of around here (Singaporean), I've never visited it in 2+ years of living here. Fortunately, I noticed a recent Bon App review mentioning how pleased they were with their meal, and how the recent change in head chef was a good thing for the restaurant. Well now I had an excuse to visit, and boy am I glad I did. Unfortunately I didn't get a picture of my bill, so I've lost the names of some of the dishes, but I'm sure it'll be clear what I'm talking about when comparing my descriptions to the pictures. 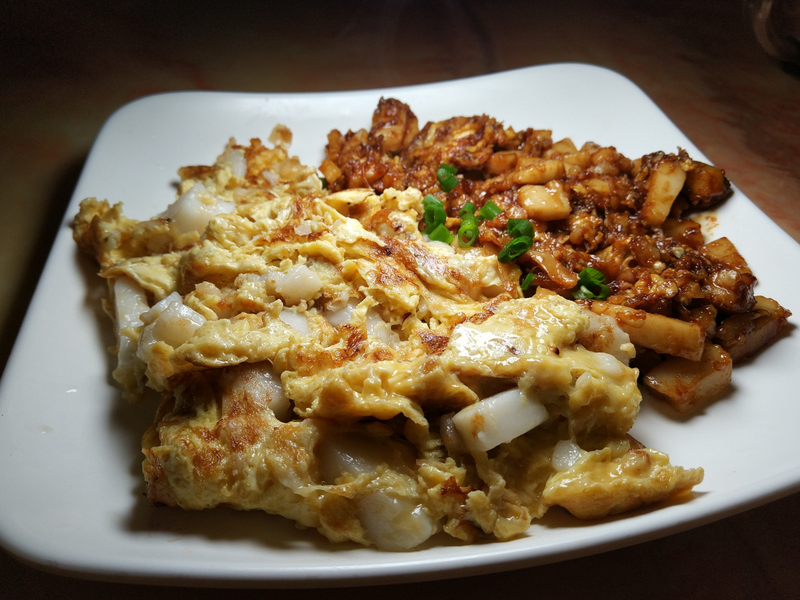 Egg + niangao (glutinous rice cake) fried two ways was delicious. The white side was a tiny bit bland, but I suspect that's because I tried it after the dark side, which was rich and soy saucy and delicious. Take a bite of both if you want to even out the flavors maybe. I don't know if this is a particularly authentic take on the dish...I'd need a SG friend to verify for me...but I'm not complaining a single bit about what I got here. 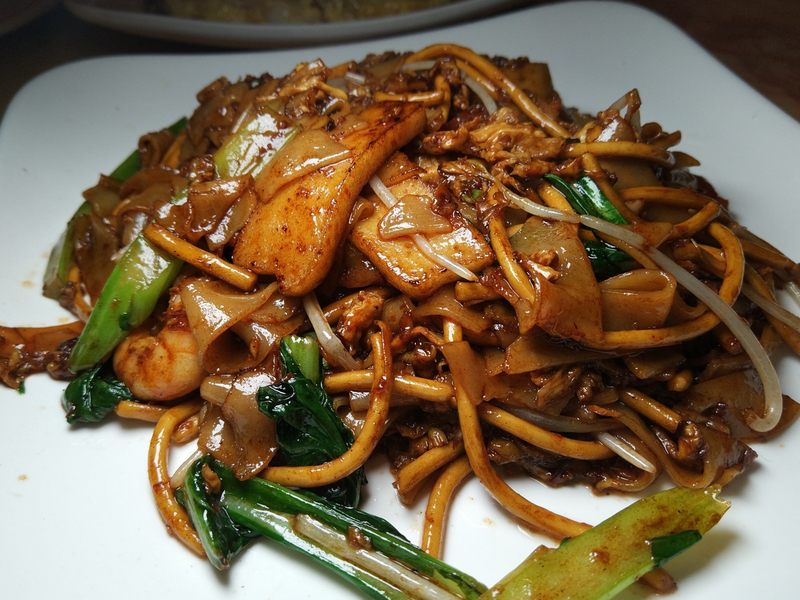 The char kway teow was also very good. It didn't quite bring me back to the sidestreets of Penang, but it reminded of them, and that's pretty good. Of course the dish cost way more than it would on a Penang sidestreet, but this is Shanghai. 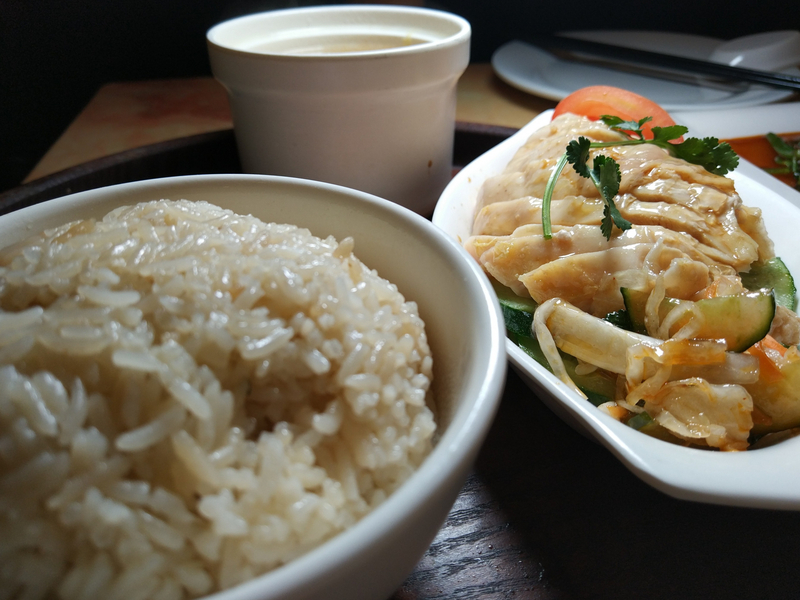 The Hainan chicken with rice was so refreshingly good after the last few disappointing ones I've had in Shanghai. The chicken meat was tender, the fat layer on the chicken was thin but just thick enough to provide moisture, and the rice was perfectly slicked with chicken fat the way it's supposed to be. When done right, this dish manages to be both rich (thanks to the hearty chicken fat) and refreshing (thanks to the cool, lean chicken meat), and this iteration ticked the boxes. I felt the side of soup was pretty bland though. 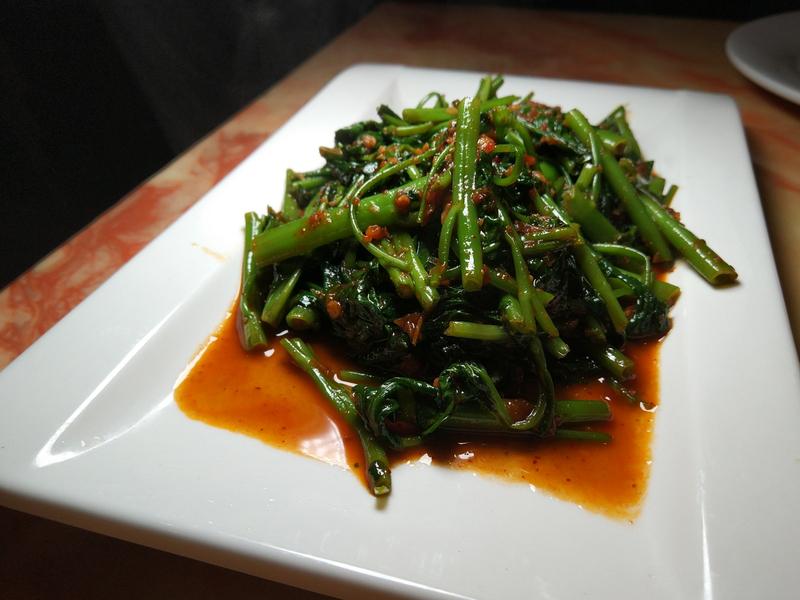 The stir-fried morning glory with sambal was the only hiccup in the meal for me, although my girlfriend liked it. I felt it was a bit too spicy, and I do like spicy food, and I do like sambal, but this just wasn't quite doing it for me. The matcha tea was fine, but I'm farrrr from being some kind of matcha expert, so take that with a grain of salt. Overally, I'd give everything 4 or 5 stars out of 5, except for the too-spicy morning glory. The price was very reasonable for how full we were, something in the neighborhood of 180 RMB if I recall correctly. 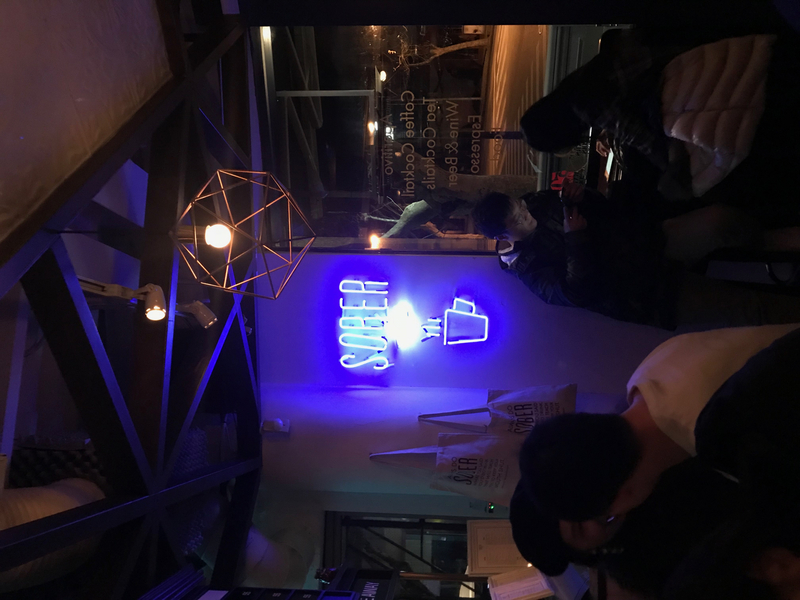 SmartReviews is SmartShanghai’s crack squad of amateur reviewers, eating their way around the city and writing about it. 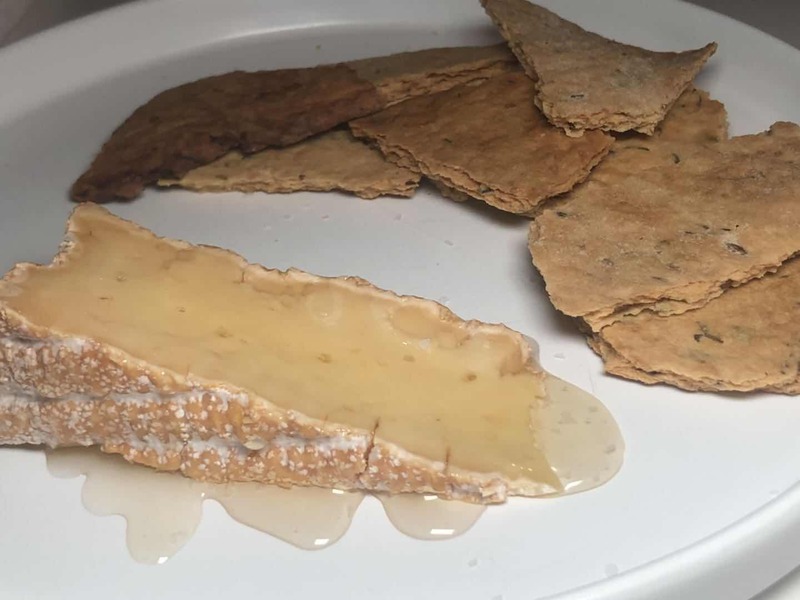 They have been chosen from a large pool of applicants and given a set of strict guidelines to follow to make sure their reviews are honest, informed and fair to both potential customers and the restaurants themselves. Shanghai is the 10th city that Ting has called home. She works at a Chinese social enterprise and loves immersing herself in new cultures and chasing new experiences, particularly food. Originally from the UK, with 40 years of experience in the hospitality industry, Globaltraveller has worked on four continents and opened seven hotels in Asia for hotel groups in Beijing, Nanjing, Shanghai, the Maldives and Malaysia. Heatwolves has spent the last ten years exploring Shanghai as a writer, editor and DJ and is now a consultant and strategist for F&B, music, and art projects. You can find him on Instagram at @lovebanguniverse and leaping forward at InkSight Agency.